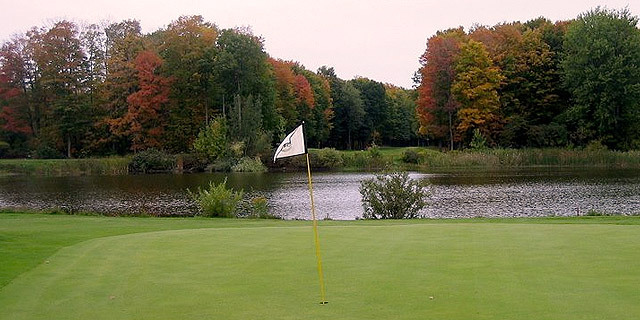 Conveniently located just north of Toronto on Highway 48, the Maples of Ballantrae offers an 18-hole Championship Course and a 9-hole Executive Course. The 18 holes course measures 6625 yards from the back tees and is a challenge for all skill levels. It has gentle rolling fairways, strategically bunkered greens and an assortment of woods and water to test your accuracy. The 9-hole Executive Course is ideal for beginners, juniors, families, seniors and anyone who does not have time for 18 holes. Our recently renovated clubhouse, built in a rustic post and beam style, features a solarium dining room, lounge and banquet room with floor to ceiling windows. It includes a spacious patio with a gazebo which overlooks the golf course and lakefront. It is a picturesque setting, perfectly suited for indoor and outdoor dining any time of the day. We offer an ideal venue to host tournaments, weddings, banquets and conferences of up to 300 people. If you are looking to learn or improve, the Maples Golf Academy provides a wide variety of training programs, offered by qualified CPGA professionals. The friendly staff at Maples look forward to serving you soon!